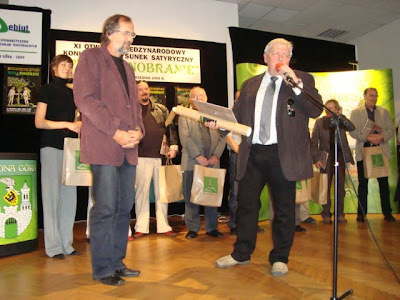 Grand Prize winner Bretislav Kovarik fom Czech rep. (left) & Organisator Ryszard Blazynski (Poland). 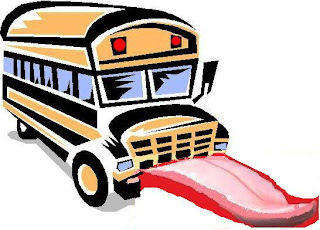 EL BUS No. 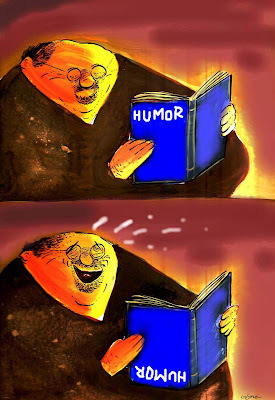 43 acaba de salir del paradero a su recorrido humorístico semanal. EL BUS No. 43 has just left the terminal on its weekly humor tour. 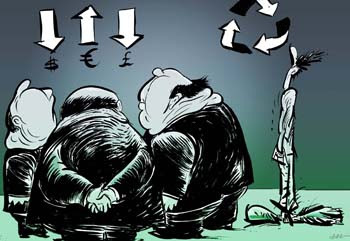 Pronto daremos a conocer todo lo relativo a BOSTOONS 2010. Estén atentos. We will soon release all about BOSTOONS 2010. Be on the alert. Y no olviden pasarle este email a sus amistades. All persons 18 years of age and older are eligible to participate in this international contest. Participants declare to agree to the terms and conditions of the regulations, and the decisions of the juries. Belgian law governing withholding tax on prizes won by foreign participants applies. Participation is free of charge. A cartoon is a humorous drawing. This includes a caricature of a famous person, a parody of a real situation or simply an image of a funny situation. 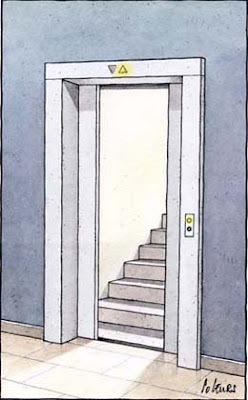 The cartoon can consist of one image or take the form of a short comic strip. 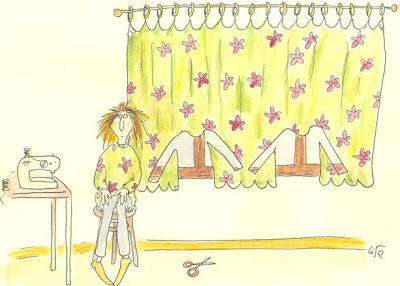 The cartoon can be static (drawn) or moving (animated using a computer). a. Drawn cartoons: maximum 5 submissions. What? black/white or colour. The cartoons may not contain text. Drawings may also be made digitally and submitted on CD-ROM. They may not have been exhibited in Belgium or awarded in other countries. They must be packaged flat and not folded. How? Dimensions (min. 21 x 30 cm) or (max. 30 x 42 cm). If submissions are sent on a CD-ROM, the cartoon must be no larger than A4 format, in TIFF format with a resolution of 300 DPI. Works under glass, framed or other materials are unacceptable. b. Animated, moving cartoons: maximum 3 animated cartoons, with a maximum length of 3 minutes per animated cartoon. How? These animations must be sent on a DVD (PAL format). We can accept no submissions via URL (YouTube, MySpace, Google Video or Quicktime uploads), No demo versions, but the complete cartoon must be submitted. The works must be in Dutch or English, or subtitled in one of these languages. c. The sender remains responsible for the originality of his or her work. Discussions and possible claims concerning all forms of plagiarism and the like are for the expense of the sender. Participation is valid only if your date of birth has been filled in and the form has been signed. The back of each cartoon must indicate: last name, first name. Submission is at the expense of the participants. By participating, participants grant the organising body the right to use their submissions as advertising for the "International Cartoon Festival" and the seaside resort Knokke-Heist, (e.g. as cartoon book, catalogue, advertising in the press and other media, separate promotional printed works such as posters, leaflets etc., promotional gifts by the city council and/or photo festival organisation, calendar). An international jury will make a selection from the entries for the exhibition, and will select the prize winners. All participants may visit the exhibition free of charge upon presentation of their proof of participation. All submitted works become the property of the organising body. 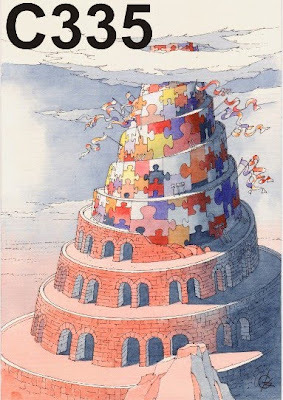 In collaboration with "Davidsfonds" Leuven, a cartoon book will be published, subject to budgetary and technical constraints. Selected participants will be entitled to one copy. DEADLINE: 30.01.2010 (By checking the festival website where the regulation 2010 is published now and the short correspondence I had with the organizers today, I am sorry to tell that the deadline is already over for it was JANUARY 12, not the end of the month as my source indicates. Well, I would not post my cartoons for this year's edition it seems and I say that it will be the best way to send work for this legendary competition in the month of December, never later! 21.01.2010). Ten (10) honorable mentions, in the form of plaques. Trump Tower, 721 Fifth Ave, Suites 59H & 60H, New York, NY 10022 (no phone or fax calls, please). Entries for awards must be received on or before November 12, 2009, to cover work done in the year 2008/9, reflecting the importance of human dignity, mutual respect and friendship among nations, as well as economic consideration and environmental responsibilities towards each other. While cartoonists may send in what ever they please, the contest does not encourage maligning member nations or their leaders. Every entry should conform to the stated limits and size before it can be given jury consideration. All exhibits should include a biography and picture of entrant, and be in English. 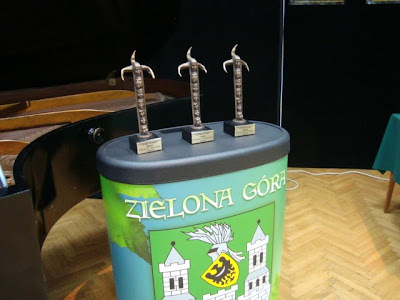 Third Prize: 500$ + Trophy + Honorable Mention. Results Cartoonale Brugge 2009 with theme "Crisis"
On September 19, 2009 the ceremony took place in Bruges Cartoonale. Pol Leurs from Luxembourg captured the first prize of 1000 Euros. and the third prize (250 euros) to O-Sekoer, two Belgian participants. The virtual catalog can be viewed online. can be seen from September 19 to October 14, 2009 in the Hall of Culture and is open free daily from 10 to 17 hours. Ramiro Zardoya Sánchez - Cuba. Silpa Prasad, Civil Engineer, Hyderabad. 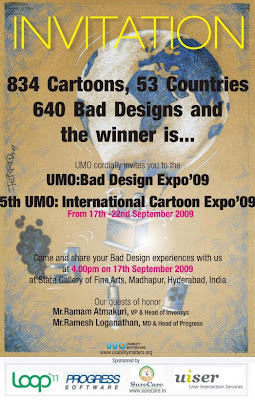 UsabilityMatters.Org is organizing an International exhibition - UMO: Bad Design Expo'09 and 5th UMO - International Cartoon Expo. The inaugural event was at State Gallery of Art, Madhapur, Hyderabad on 17th of September at 4.00 pm. The guests of honor Mr. Ramam Atmakuri, VP and Head Invensys and Mr. Ramesh Loganathan, MD and Head of Progress gave an auspicious start to the occasion. 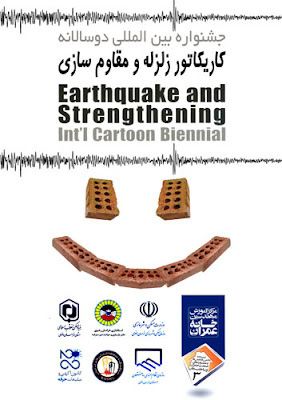 Bad design and Cartoon contest entries from over 53 countries are on display from 17th to 22th September, 2009. Results will be announced on Sunday the 20th of September with public voting taken into consideration. The sponsors of this international event are loop11, Progress, Cog-Sci lab IIITH, Surecare, uiser, Dr.Santh's and Krishna Speciality Chemicals. 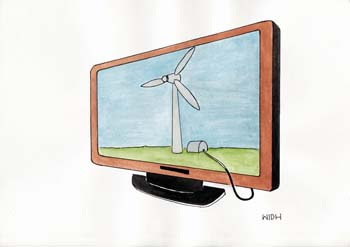 We are very pleased to inform you that is open the on-line voting for the PortoCartoon 2009. The public can choose its favourite cartoon, independently of the choice of the jury of this festival. 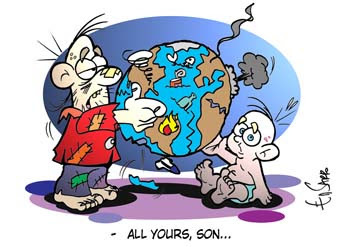 People all around the world can vote in the Cartoon Virtual Museum at: http://www.cartoonvirtualmuseum.org/f_portocartoon_2009_vote.htm. 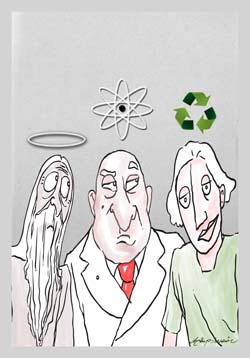 24 artists are in contest, and each cartoon can be seen in detail. 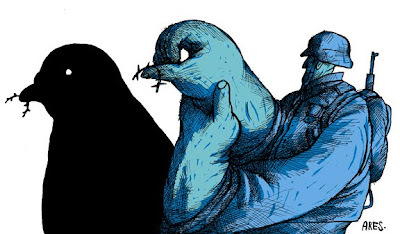 The candidates are the awarded, the honourable mentions and the finalist ones of the 11th PortoCartoon-World Festival. Entries: max. 5. The works must be accompanied by the author's biography. The Daejeon City is inviting world cartoonists to take part in the 19th Daejeon International Cartoon Contest (DICACO). 1.This year's contest comprises a Thema section (titled Oddity - Monster) and a Free section. 2.The size of works should be smaller than 297 mm × 420 mm. 4.Each entrant should provide title, name, age, address, e-mail, telephone number, and career on reverse. 5.The deadline for entry is Jun. 30, 2010. 6.Entries should be addressed to the Daejeon International Cartoon Institute, 450, Wolpyongdong, Daejeon, 302-280, Seoul KOREA.7.The most creative cartoon will win the Grand Prix prize of $3,000, Gold prize of $1,000, Silver prize of $500, Bronze prize of $300, and 300 Selected works will be awarded. 8.Exhibit the cartoons at the Daejeon Public Gallery in Aug. 2010. 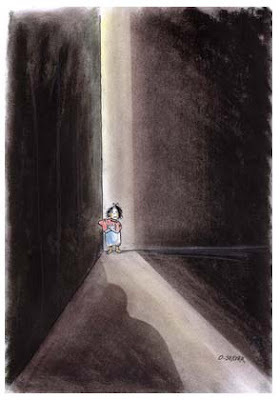 9.Submitted cartoons will not be returned, but exhibited forever in Korean public halls, galleries, & museums. 10.Your cartoon may be used for promotional purposes: cards, posters, catalogs, newspaper, magazine, and books, etc. 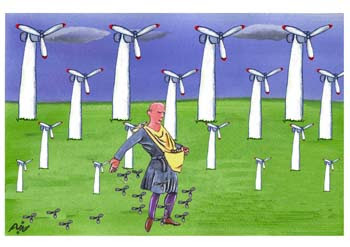 Professor of the Daejeon International Cartoon Institute, 450,Wolpyongdong, Daejeon, 302-280, Seoul Korea. *You’d better send us “soccer cartoons” to 28th February 2010 & your career, books, works world for DICACO 20 anniversary. *Please check up 30,000 cartoons in Kongju Cyber Cartoons Gallery (www.dicaco.com/dicaco.kongju.ac.kr). 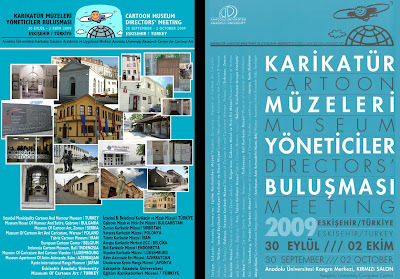 We intend to hold an international meeting to enable communication and interaction among the directors of cartoon museums in the world. e) to devise a collective guide of “world cartoon museums”. Jacqui Yungman and Ronit Eshet, Culture Department, The Division of Culture & Art, Haifa Municipality. Alberto Ribeiro Palmieri, de Meridiano / Brazil (Top above). Omar Alberto Figueira Turcios / Spain. Raimundo Rucke Santos Souza / Brazil. Gonzalo Rodriguez, Porto Alegre/ Brazil. Luigui Rocco Pasquale Recine / Brazil.